chipped, and beautiful, and L.O.V.E.D. The great blizzard of Feb 2013 is done. Behind us. Plowed, shoveled, scraped, and slowly melting, and refreezing. It came on a Saturday — but it didn’t keep me from doing Saturday things. Our 8am Weight Watchers meeting didn’t happen. Our little world didn’t begin digging out of the powdery white cocoon until about then. Peter was the first to pull the cord on the snow blower on our street. Although I was still feeling poorly, I couldn’t let myself stay inside and just watch him work. Even though he yelled at me a few times…..I could manage shovel duty. And so, I did. We were done, and re-connected to the world by 10am, even though our town hadn’t found our street yet. The plows were still out there, somewhere. Inside, to coffee and some breakfast….connecting to FaceBook told me — Weight Watchers was Open For Business! 11am meeting — Come One Come All! Well — here Comes One. And so — onto the streets I went — 4-wheel drive engaged! I had already decided — that today was my new start. Don’t expect perfection Diane. Not today. Not on any day. Perfection is too damned…. perfect. Perfect people and perfect things — never get touched enough, or used enough, or loved enough. They just sit in a distant corner, and watch as the world happens. Too afraid to risk a chip, or a stain, or a tear. Sitting in the cupboard while the less perfect dishes get used for company…..all stained by tea and pie and j.o.y. Tucked away in the closet, as the less perfect dress is wrinkled, and smudged, and hugged and loved. Sitting on the couch at home alone, as the less perfect people dare to invite others over to spend time — opening their home — baring their soul — displaying its fragility — risking it all — for the opportunity to connect. To become part of another. To belong to something grander than yourself. Something that loves you because of your imperfection! Perfection need not apply. Life is too messy for the perfect….unless you plan to live it in the cupboard, or in a closet, or on the couch. Sounds perfectly b.o.r.i.n.g. to me. Trying to be perfect — because that’s what I thought people wanted from me — and avoiding the risk of any embarrassment…..has been a defining reason for my time spent on the couch. It was SO much easier to say NO to things I didn’t know how to do — than to risk embarrassing myself trying stuff. At the time….it seemed to make so much sense. Looking back from where I am now …..I shake my head and wonder….Why, Diane, did you expect yourself to be so damned good at things you’d never done before? Why would anyone, expect that of themselves? How perfectly harsh. I wonder where that came from? Maybe it came from a lame attempt to overcompensate for all the parts of me that I felt were already so damned imperfect. As I look back, I spent most of my life feeling like a chipped cup. You know…..sparkling clean, decorated with some lovely features. Lined up next to all the other cups…I looked like I fit in, like I belonged. But…..there on the lip….was a tiny little chip. A tiny little flaw that most others would not / could not see. But to me…it might as well be highlighted! I f.e.l.t. my flaws every single day. I felt my weight every single day. From the pants that were always too tight, to the shirt that couldn’t be long enough to cover my belly….to not knowing where to put my hands, so I could cover all the jiggley bits I didn’t want people to see. I was never comfortable. I could never relax. I lived my life as a chipped cup. Knowing no one would want me — when there were so many other perfect cups. Tsk, tsk, tsk Diane — so harsh. so unforgiving. so unaccepting. so blind! This year, I had an epiphany. I’ve finally come to appreciate my little cup…..chip and all. And here’s why. I have this Belleek tea cup. I’ve had it for…well…..as long as I can remember. 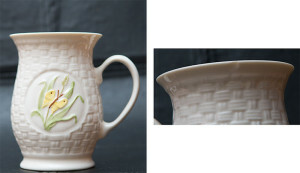 Belleek is one of my favorite, favorite things. It is this china made in Ireland. it’s hand crafted, and often woven. Painted on the face of the cup, are the trademark emerald-green Irish shamrocks. l.o.v.e l.o.v.e! This particular cup is painted with spring flowers and a butterfly. A yellow butterfly. So — lets break this down. This cup is as close to p.e.r.f.e.c.t. as it can get for me. Well — one day my cup went into the dishwasher — and it came out — with a chip. [Dun Dun DUN!!!!!] Holy S#IT, a CHIP??? Yea. For a fleeting second…my mind thought, “Oh well. Gotta throw it out.” Then I smacked myself (just like Cher smacked Nicholas Cage in Moonstruck!] — SNAP OUT OF IT! This is your Belleek cup! Who cares if it has a chip? In fact, it’s on the back, on the lip of the cup, and you can barely see it, or even feel it when using the cup. So WHAT if we KNOW it’s there. That chip exists because we L.O.V.E. that cup, and we L.O.V.E. using that cup and …..well…..I’d rather get rid of every other cup I have before I ever get rid of that cup. and that’s just how much I love it. Chip and All. And this is how life goes. So often….the things we SAY we love….are up on a shelf, or in a curio cabinet, or in the closet – maintained in a pristine box or bag. So They Can Be PERFECT! And just as often ….the things we REALLY love….are worn out, and stained, or – god-forbid…chipped. Because we’ve used them, adored them, spent our lives WITH them. It NEVER mattered at all if they were perfect or not. In fact — the softer, and older, and more comfortable they became….the more we loved them. I know now, after 47 years, that I AM indeed a chipped cup. Maybe woven, with a yellow butterfly and shamrocks! What I Never Was…..was any less because of it. This … is the lesson of 47 years.